Have you lost your mobile phone? Or you are upgrading in new phone. No one want to lose his contact list. It is necessary that you always take backup of your contacts list at different location either in your hard disk or any cloud service. Now, watch how you can easily take multi backup in different locations of your contact list. After reading this article you will be able to easily take or prepare backup of your phone contacts easily. To use inDefend you have to first sign up in a free account. This step is necessary because by doing this you can connect two Android devices for backup and quick restore. Your all data encrypted, there and it all stored on servers of inDefend. From where you can anytime access your data. Along with contact list, you can prepare backups of other data by using this free app. You can install this app from Google play store. This app is a good replacement of phone-book and dealer for Android phones. By this app user can export contacts in device storage in single VCF files. This file can be transferred on another devices too and you can use this app to import contacts in your new device. By this app you can import contacts from your SIM card too. This app has a function which is called merge, which allows you to search duplicate contacts from phone book and remove them. You can install this app from Google play store. This is a multi-dynamic app, which helps you to prepare backup of any file which is existing in your phone memory card. This app helps you in transferring of files on your phone from internal memory to memory card. It syncs your data with cloud service. You can use password protection system too to save your data. You can install this app from Google play store. This is a new app. This is a Add supported app whose interface can easily be used and it works very perfectly. It prepare back of your contacts in your own device and it gives you an option to email your backup files. You can save multiple files in your pc for storage. You can install this app from Google play store. If you give priority to local (offline) copies of your contacts then this free app is a good solution for you. This app saves your contact’s one-touch backup in your device in VCF format and allows you to export it in CSV format. You can store the backup file in cloud storage or email it. This is a complete security app for your Smartphone. Along with common security features like Tracking, Remote wipe and Privacy adviser this app has contact backup solution too. This app save all your contacts in the cloud, which can be restored and download in PC. You can install this app from iTunes and Google play store. In this app one plane and simple interface. It works with multiple accounts which you connect in your windows phone devices. You can select any account which you want to use and it creates a contact (VCF) file that saved in your OneDrive cloud storage. You can save it at local level in your own device too. Be careful that it doesn’t support contact’s restore. This free app gives you basic options to create contact backups and restore them. This app saves your backup files in XML format and display all list of files which is made on your device. You can delete and backup file before restore them. Old Blackberry device users can user free backup contacts app. You can download and install this app from Blackberry app world. Sometimes it happened with you that when you dialed your friend’s number and you find that his numbers has been changed. What happened when your phone-book update itself with the latest numbers. If you change your contact details, then it itself updates on others phone too, and the same should be happened when your friend change his number. For this feature you can use a free cross platform app like In touch app. In touch works on Android, Blackberry and iOS devices. It automatically creates backup of your contacts in cloud, syncs your contacts in multiple devices, transfer all your contacts in new phone and keep your contacts always updated ( this can only happen if in others phone In touch app installed too). Phonecopy app helps you to create backup of your own phone contacts, messages and calendar entries and sinks all of them in your device. For this you have to sign up in a free account so that all your data can be stored on Phonecopy server. This app offers free apps for all smartphones and its few features works on phones too, which supports synchronization of data connection. You can check on www.phonecopy.com that your phone is eligible for this feature or not. Once all your contacts saved on its servers, then you can login in web browser and access your contacts and edit them too. You can download and install this app from Blackberry appworld, iTunes and Google play store. Almost all brands give free desktop software, by then you can create regular backups of your contacts. Usually there are two options. 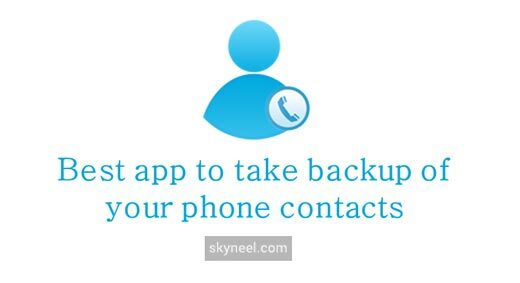 In one option backup of phone content can be prepared on computer so that when it needs you can restore data or sync contacts to your address book. This is a rare free contacts for iOS devices. By easy backup you can create one touch up backup of your all contacts. You can email to yourself this backup. By native mail app you can restore your backups in your device. You can install this app from iTunes.